Friday brings a change to the White House, a power shift in Washington. I hope—whether you’ll be commiserating with family and friends, celebrating, or marching in protest—that you’ll take a few moments first to ponder darkness and light, contempt and compassion, condemnation and grace. I’ve seen buzz growing around the idea of going dark on Facebook this Friday by posting a completely black rectangle where your cover photo would normally be. I confess the idea has some appeal to me, but I also know I have to carefully guard my own soul and heart and mind from settling in with dark thoughts and fears. There are some books you shouldn’t read in public unless you don’t mind crying out your eyeballs in front of strangers. Corrie ten Boom’s The Hiding Place is one of those books. Four weeks ago, I invited you to join me in reading The Hiding Place and planned to read it myself on a cross-country flight. Even the first two chapters forced me to stifle tears, and I only dared read part of it on the plane, stopping after I pressed against the window to sob quietly. I saved the rest of the book for home, reading it only in daytime, as if the only way my heart could absorb what I was reading was to have the sunlight as company for the dark pages. Does this admonition to be at peace with everyone make you uncomfortable? What about that part about giving your enemy something to eat or drink? I love the concepts of peace and kindness but often fall short in the actual practice of them, especially when it comes to people I fear or do not like. I’ll admit it: Being at peace with a vague “all men” seems easier to accomplish than giving my own personal enemy something as life sustaining and as simple as a glass of water. Is it part of the human condition to want revenge? We want villains to suffer as their victims did. We want evil masterminds to die at the end of the movie (and in real life). We want some sort of street justice for the neighborhood jerk who lets his ferocious dogs terrorize children and adults alike. We don’t want to give water and food and kindness to such as these. We don’t want to wait for God’s vengeance (perhaps because we can’t believe it will be as severe as we’d like). We want to heap the coals on our enemies but not by practicing acts of kindness toward them. We want to heap coals by leaving them thirsty and hungry and in pain. Yet we know stories of those who heap proverbial coals by extending kindness instead of hatred. We are surprised when grieving families of shooting victims stand up in court and speak forgiveness to the killer. And when gruff people show a tender heart for someone in need. And when undreamt of reconciliations happen in our own families. It shocks us to see kindness where we would expect apathy or rejection or cruelty. The Syrian refugee crisis is front and center in the news, and perhaps like me, you’ve experienced shock at Hungary’s refusal to help and relief that Germany has flung open its gates and greeted the refugees’ trains with kindness. If my neighborhood were to become a border town for refugees pouring in, I hope I would be more like Germany than Hungary, and I hope it wouldn’t take the photo of a dead toddler to get me to find new ways to tap into the depths of sacrificial kindness. Too often, though, we seek our own safety and comfort instead of extending an inconvenient kindness to one another. We hope others will step up to help so that we only have to pay lip service to the sort of radical kindness some tragedies require of us. Romans 12 doesn’t leave much room for negotiation, though. Radical kindness is how we are meant to interact with those around us. “So far as it depends on you, be at peace with all men.” Being at peace means a willingness to be kind when it’s undeserved. And being kind can bring about peace where there otherwise would continue to be animosity. How would our world look if we all acted on these verses and actively tried to be at peace with all humans? How would our world change if we let go of our desire for revenge and instead practiced kindness? Have you experienced a kindness that led to peace? 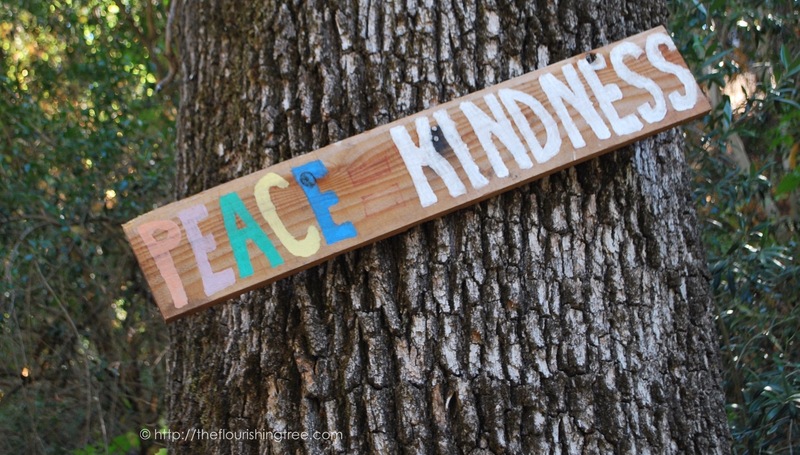 What about a peace that led to kindness? I’d love to hear the ways you’ve experienced peace = kindness in your own lives.